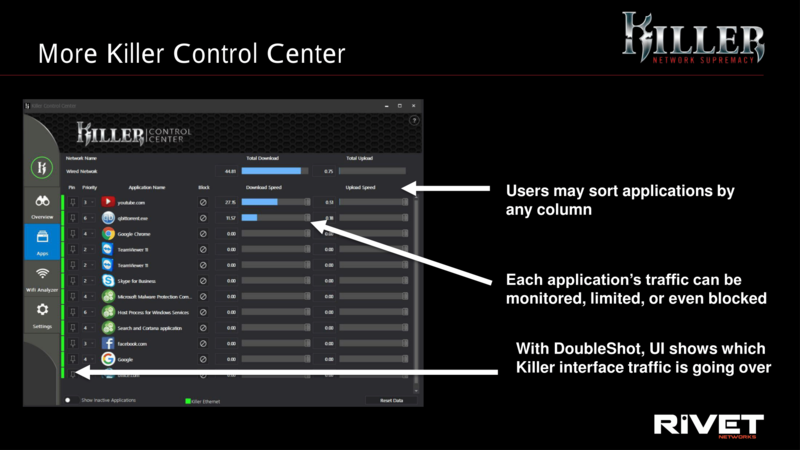 The Killer brand of network controllers is evolving. 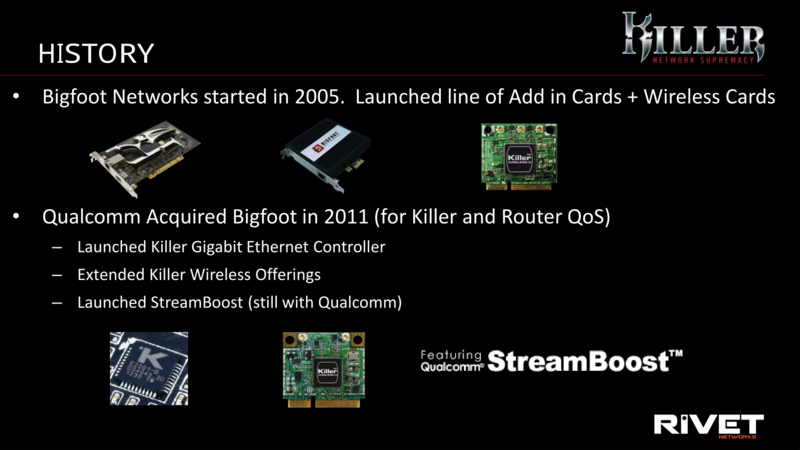 The original company, Bigfoot Networks, launched on FPGAs over a decade ago, with super large heatsinks (that are now collectors’ items), and were eventually purchased by Qualcomm. The technology was updated into custom ASICs, but a lack of investment meant the technology meant that the brand stagnated a little. After discussing with QC, a number of the original Bigfoot team have spun the brand back out into a new company, Rivet Networks, while retaining a strong partnership with Qualcomm. We've kept tabs on the company, and their mantra is one of promotion and evolution: today is the launch of their new E2500 network controller, with a new UI. 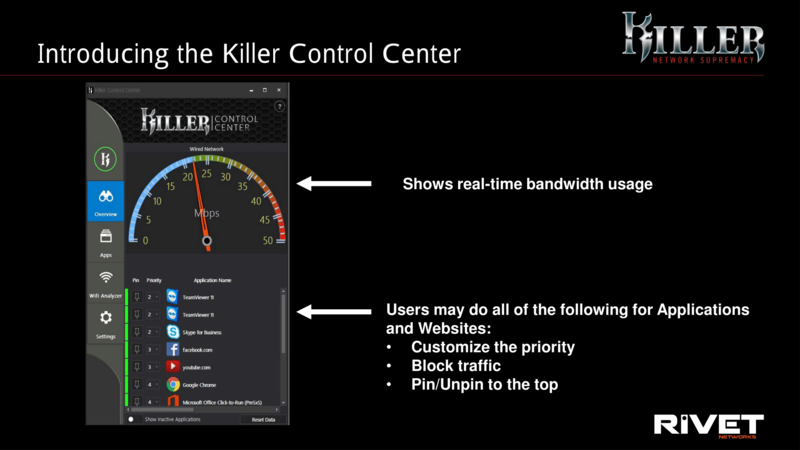 Describing why users should buy Killer over other solutions (and solutions that users have experience or feel comfortable with) has been difficult because the technology behind Killer requires a lot of prior networking knowledge. Public demos showing the feature sets have been obscure at best, and overly technical at worst. Nonetheless, the E2400 previous generation product was widely used in MSI, GIGABYTE and ASRock motherboards, as well as a range of gaming focused laptops as both an extension of marketing towards gaming products as well as the promise of increased performance. 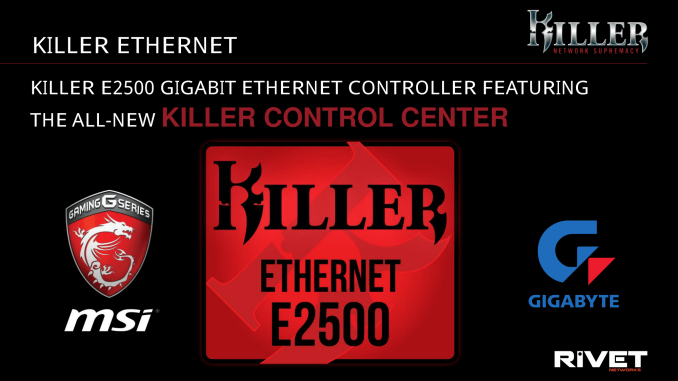 The new Killer E2500 network controller is likely to make its way onto new motherboards and systems as they are released over the next few months. The E2500 is a newer ground-up design, which Rivet says offers better packet processing metrics than the E2400 and other competition based on a redesigned foundation for network application detection. Aside from automatic implementations purely in hardware, the software for Killer solutions is also important, and this is where a significant change occurs with the E2500. 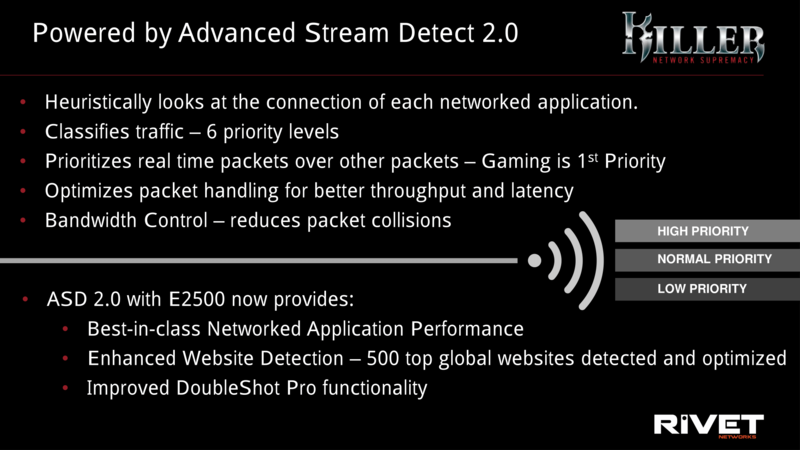 The E2500 uses ‘Advanced Stream Detect 2.0’, the marketing name, for network connection detection and the packet analysis implementation. Rivet has designed it to not only detect programs and apply a priority spectrum, but it also detects up to 500 whitelisted websites in a browser agnostic fashion. This allows users to prioritize, for example, a Youtube video in one browser window at a higher priority than another browser window all while downloading, as well as keeping any game at priority one (and windows updates at priority six). There are parallels with Intel’s processor line in this way of thinking. The latest Broadwell-E chipsets were marketed with a large spoonful of ‘mega-tasking’, for the user who wants to do it all and do it at once. This is the value add that the new Killer line is also going for – gamers who want to stream, or multifaceted users that do several tasks at once. So in order to play a game or a video, while also performing on-the-fly encode and upload, the downloads do not have to be switched off, for example. The idea of improved Quality of Service by prioritizing content isn’t new - we’ve had cFos as a software tool for years (even bundled with a number of motherboards), however Rivet has stated that their hardware solution aims to provide better performance (packet processing latency, dispatch latency and prioritization) for less CPU time than the competition as well as a simpler interface this time around. The hardware solution deals with six levels of priority, with priority one being ‘real time’ and guaranteeing a front-seat in processing and being placed in the next packet. Detected games (from an internal list) automatically get priority 1 or 2, with messaging programs at 3. Website traffic goes in at either 3/4/5, depending on how the website interacts – video and audio is given a 3, most traffic is a 4, excess traffic is a 5. That leaves priority 6 for updates and large time-insensitive downloads. Programs or websites that need to be adjusted frequently can be pinned to this list, especially specific websites that can be chosen (for example, Facebook/Youtube/Twitch). The major speedometer on this front screen shows real-time bandwidth use (highest value of download or upload), with the maximum value determined via a speed test in the Settings menu. The meat of the software is application management, which is the next tab down. Here we have all the applications listed, with buttons for direct blocking of access (if you see something consuming bandwidth and not sure what it is), as well as per-application bandwidth limiting via sliders for upload and download separately. 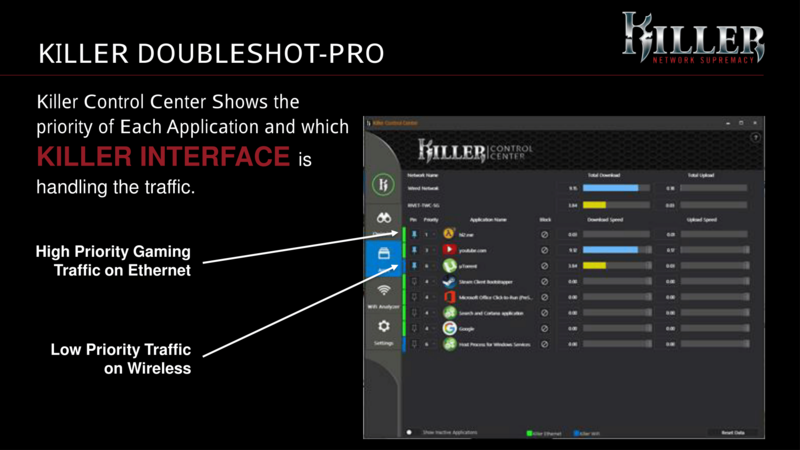 Both this screen and the last screen work with DoubleShot Pro, Rivet’s name for when two Killer interfaces are being used simultaneously. 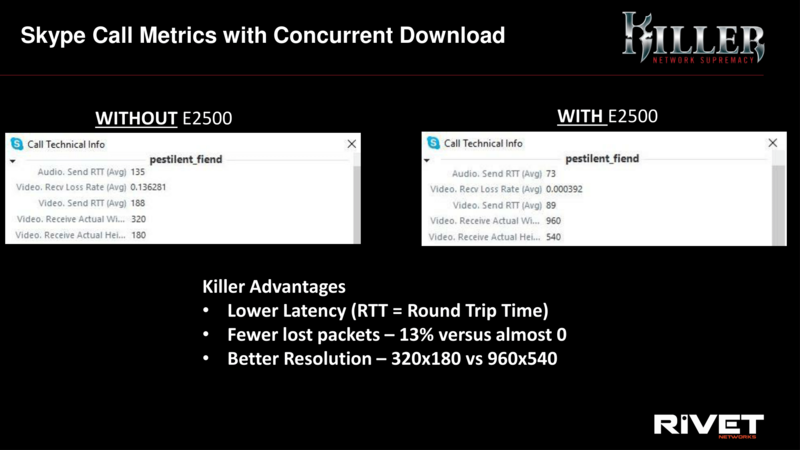 They use the wired+wifi as an example (so E2500 + 802.11ac Killer 1535), whereby the user can have priority 1-3 going over the wired connection for the best latency, and 4-6 over the wifi as something less critical. The color on the left indicates which connection (currently green for primary, blue for secondary), and the download and upload bars adjust in color as well for parity. With two connections, the main overview interface will show two speedometers as a result. The software is continually a work in progress (Rivet Networks seems very happy to take on board any user comments) and is currently geared for release with E2500 equipped systems. When we spoke with Rivet, they stated that the new interface will work with the 1535 Wi-Fi module for the most part, but the E2400 and below will some features disabled due to the updated configuration on the new silicon. Ultimately the Killer solution is marketed to offer better packet processing and network stream detection for hardware-based prioritization over any competitor solution, and any OEM that goes for Killer will be able to use the software on their platforms. No doubt we will see Killer's SDK allowing for customized interfaces as well in due course. Identifying how the Killer solution affects the end-user is going to be tricky, as the multi-tasking benefits of stream prioritization are hard to accurately measure, or that packet processing is a badly understood and usually synthetic metric. Something such as video conferencing while downloading is perhaps an interesting future metric to monitor: similar to how testing SSDs has evolved, testing network solutions to accurately represent real-world situations has to evolve as well, and we’re aiming to adapt along those lines. It will be interesting to see how the new (and old) solutions from Rivet, Intel, Qualcomm and Realtek perform. Exactly. I had E2201 on my Z87 G1 Sniper 5. With their driver is installed, it's giving me BSOD twice a day. After I uninstalled the driver and making it an "unrecognized device" in device manager, my system has never BSOD'ed once. I gave it another try when I upgraded to Windows 8 and it's same crap even after Windows 8 was released for at least a year. If my MB only had that single LAN port I would be doomed, but thankfully there is also an Intel I-217V. It's pretty clear from comments here that opinions about Killer NICs are resoundingly negative. I've seen that evidence elsewhere as Killer NICs are regarded poorly in product reviews. 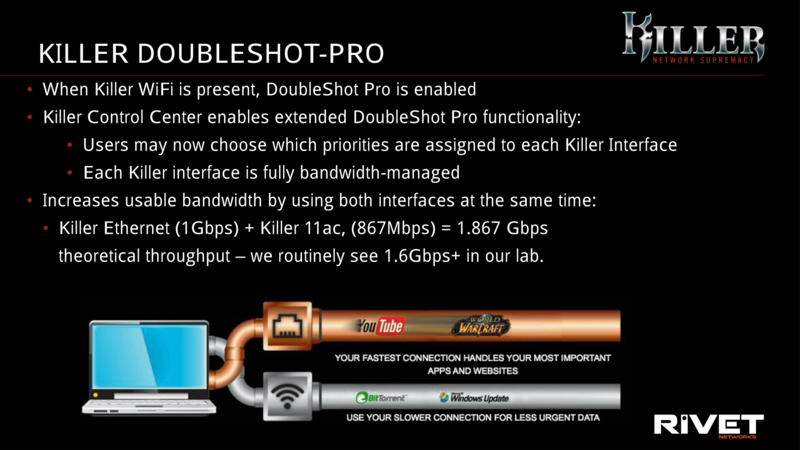 Of the few benchmarks I've looked at, benefits (if they really existed at all in prior products) are close to or within a reasonable margin of error when compared to other competing network adapters. That stands to reason, of course, because the network adapter has no control over data packets once they're placed on the wire. After that point, latency, transmission priority, and so forth are controlled by other equipment that is outside of the end user's reach. In my opinion, the negative branding perception is caused by two factors. The first is the problem of the NIC's lack of reach into the network as explained above. The second is a perception of poor quality as articulated by people retelling problems they've had with drivers and software. Having changed hands multiple times (Bigfoot, Qualcomm, and now Rivet) doesn't exactly help that brand image because it makes the product look like an unwanted orphan with little market appeal -- something that's clearly and obviously true based on the response this article's gotten. Since Rivet Networks consists of leftovers from Bigfoot Networks, a company that already failed to build a successful product once before, those same people will need to have learned a lot from their prior mistakes if they intend to survive. People, right or wrong, have long memories over being burned by a particular brand in the past. Even with expert execution, I don't see how a premium network adapter brand will ultimately find success under the conditions Rivet is working with. Ultimately, Rivet is still _just_ a spinoff company of Qualcomm which makes one think the fruit of the new company hasn't fallen very far from the mother tree. Buying anything with a Killer NIC in it is a risky venture for the buyer since the new company is unproven which might leave someone stuck with an unsupported, non-functional adapter that's been abandoned by a now dead business entity. Having said all that, it's clear that you have reasons for coming to Rivet Networks' defence even if we're not privy to your motives (nor should it matter). I think the majority of us, in spite of our present opinions, are willing to entertain a product review. If the E2500 can demonstrate some measurable benefit, perhaps it has a chance.